What's confirmed for Destiny 2 Forsaken? Not long to go now, Guardian. How will we cope without our beloved Cayde-6? He's had our backs from day one, right? Yes, we know Zavala and Ikora have each had their part to play in Destiny’s story, but when you think of the Hall of Guardians from the original game - and running around the Tower in Destiny 2 - it’s Cayde-6 and his wisecracks that spring to mind. So a Destiny universe without him… well, almost impossible to believe, right? We do have to believe it, though. Bungie's clear on this: Cayde-6 will die, and - with his ghost destroyed - there's no light to resurrect him, either. He's really, truly gone. I know. We can't quite believe it, either. Never has a Destiny expansion been more greatly anticipated than this one. Bungie usually plays its cards pretty close to its chest, but it's not been shy about telling us that it's Prince Uldren that's gunning for Cayde-6, or that he's successful is taking Cayde down once and for all. If the name sounds familiar, that's because it is. Remember the Queen of the Reef, the aloof Awoken that helped us enter to the Black Garden? Prince Uldren is - well, was - her brother, the emo-esque figure that demanded you prove your worth first waaaay back in the original game. Now it seems he's helped the Barons and the Scorn bust free from the Prison of Elders so he and his goons can take out Cayde, and not before taking the Exo's very own beloved gun, the Ace of Spades - named after Cayde's long-dead son, Ace - to complete the execution. Why? The honest answer is we're not quite sure yet. We know that Uldren's desperate to relocate his missing sister who may - or may not - have perished in an explosion on the Dreadnaught (yes, we saw her ship crash, but interestingly enough, Destiny lore insists there's been no confirmed sightings of her body). Could that be Uldren's motivation? Possibly… but right now, all we can do is speculate. A meaty revenge story is not all Forsaken offers, of course. Ever evolving to keep things fresh, Bungie will introduce a range of new and improved features. You'll track down Uldren and the Barons in a new destination called the Tangled Shore, before discovering a second destination, the Dreaming City. Here you find an new mystery in the long lost home of the Awoken people, full of mysteries. This is the first end-game destination, home of the new raid and multiple new activities for high level players. Weapons are getting a complete overhaul, too, so you'll be able to use your favourite weapon types more flexibly - such as equipping sniper rifles in your Energy Weapon slots - as well as an improved mod system, and the usual sprinkling of shiny new armour and weapons. We've also been promised nine new supers, too - one for each character's sub-class. We've also been promised nine new supers, too - one for each character's sub-class. For Sentinel Titans you'll get the new super Banner Shield, Sunbreaker gets Burning Maul, and Striker gets the Tundercrash (nope, that's not a typo), and Warlocks will get the Nova Warp for Voidwalker, Chaos Reach if they're using Stormcaller, and Dawnblade gets Well of Radiance. For the Hunters among you, you'll secure Spectral Blades for Nightstalker, Gunslingers get Blade Barrage, and Arcstrider can mix things up with the Whirling Guard. 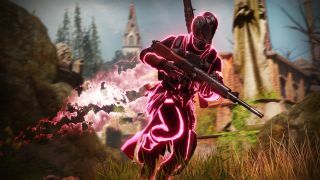 We're most excited about Gambit, though, an all-new multiplayer mode that intends to blend the best elements of player vs. enemy play (PvE), and competitive multiplayer (PvP). We gave it a go during the 24-hour free trial over the weekend and loved it! Destiny 2 Forsaken will release for PC, PlayStation 4, and Xbox One, on September 4, 2018.